Now that Scotland is following Wales’ lead with a pledge to legislate on safe staffing, what will England do? 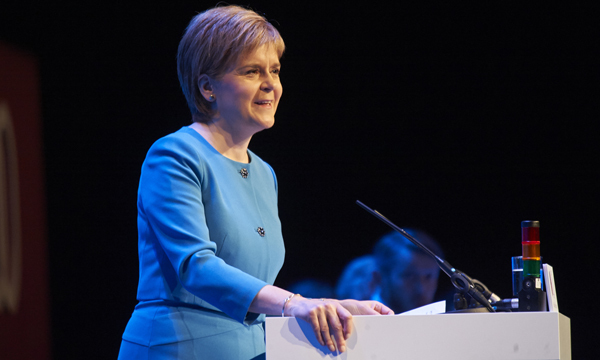 Last month, Scotland’s first minister Nicola Sturgeon declared Scotland would enshrine safe nurse staffing levels in law. Judging by the standing ovation she received at RCN congress in Glasgow at the news that nursing and midwifery workforce planning tools would be made legally binding, the move was clearly popular. Discussions are due to start over the summer about the legislation. Although RCN Scotland director Theresa Fyffe welcomed the move, she called for reassurance that funding would be in place to carry out the pledge. But what of the rest of the UK? Scotland is the second UK country to want to see safe staffing backed by law. In Wales the nursing staffing levels bill received royal assent in March, in an historic move making it a legal duty for employers to have adequate nurse staffing levels. The bill was created by Welsh Liberal Democrats leader Kirsty Williams, who received an honorary RCN fellowship at congress. She told Nursing Standard that although it is still early days for the law, its impact is already being felt. ‘Generally the view from nurses is that they are grateful a government has listened to their concerns,’ she says. Ms Williams adds that she welcomes any progress towards safer staffing across the UK and hopes the Scottish Government works with politicians from other parties to ensure legislation is as strong as possible. ‘The UK has devolved health systems, so there is always going to be variation in policy across borders,’ she says. RCN Wales director Tina Donnelly says Ms Sturgeon’s announcement has now ‘left the door open’ for England and Northern Ireland to follow suit. Northern Ireland has had a safe staffing policy in place since April 2014 to develop a framework to determine staffing levels for the nursing and midwifery workforce in hospital and community settings, but no steps have been taken towards legislation. In England the path to safe staffing has been far from straightforward. In July 2014, the National Institute for Health and Care Excellence (NICE) issued guidance on safe staffing for nursing in adult inpatient wards in acute hospitals, and then maternity settings. It was also due to publish guidance on emergency departments, but the work was shelved when a new regulatory body, NHS Improvement, took over. NHS Improvement is now leading work on safe staffing, although a date for the publication of guidance has yet to be announced. Safe Staffing Alliance chair Susan Osborne says the issue has reached ‘tipping point’ in England. ‘No one in England is listening about safe staffing. We have a fragmented approach to safe staffing across the UK and it needs to be unified. To have this variation is unacceptable,’ she says. Ms Osborne describes Ms Sturgeon’s attitude to the issue as refreshing. ‘She has said she values senior nursing advice and sounds as though she is talking from the heart, but I would like to see her go even further and legislate on nursing ratios,’ Ms Osborne says. In addition to the Safe Staffing Alliance, health union Unison ran its own safe staffing campaign which called for legislation ensuring a minimum of 1 registered nurse per 4 patients for every department in the NHS. Unison head of nursing Gail Adams says: ‘There is growing evidence that having safe staffing legislation has an impact on patient care and we continue to call for legislation. The Carter Review of productivity in NHS hospitals, published in February, recommended a new approach to record the deployment of staff on wards through measuring care hours per patient day (CHPPD). The CHPPD metric measures the combined number of hours of care provided to a patient over 24 hours by nurses and healthcare support workers. A Department of Health spokesperson said that trusts would be expected to take into account the CHPPD metric when making decisions on safe staffing and responsibility rested with trust boards. Yet RCN Wales director Tina Donnelly says legislation for the whole of the UK remains the best way forward. ‘In Wales, we did a huge amount of work collating evidence on the effects safe staffing has on care,’ she says. Guidance launched by the National Quality Board and England’s chief nursing officer Jane Cummings in November 2013, setting out 10 expectations of NHS Trusts in relation to staffing. NICE guidance on safe staffing for nursing in adult inpatient wards in acute hospitals, July 2014.